bluefish wishes to direct visitors' attention to the reports linked at bottom of this page. Dix Corp., a Spokane specialty contractor, says it recently has landed three heavy construction jobs in the Snake and Columbia river systems totaling $14.3 million and is doing some design work on a $5 million bridge restoration project in Arizona. In the largest job, for which Dix was awarded a $12 million contract, the company will construct and replace a 1.7-million-pound navigation-lock gate at Lower Monumental Dam on the Snake River, says Armin Vogt, a project manager with Dix. Dix will begin removal of the old gate on the downstream end of the shipping lock in December 2010 and complete installation of the new gate by April 1, 2011, Vogt says. Meantime, Dix will have Thompson Metal Fab Inc., of Vancouver, Wash., fabricate the replacement gate and transport it to the dam in three pieces. There, it will be assembled into a structure 86 feet wide and 110 feet tall. The gate will be replaced during an extended lock outage in which major lock repairs also will be done at The Dalles Dam and John Day Dam on the Columbia, says the U.S. Army Corps of Engineers. The Corps operates locks at eight dams, serving a 465-mile barge route that reaches from the Pacific Ocean to Lewiston, Idaho, on the Columbia and Snake rivers. The Army Corps designed the gate-replacement project at Lower Monumental Dam, Vogt says, adding that the old gate, which has been repaired several times, will be recycled. Separately, in a $2 million job at McNary Dam, on the Columbia, Dix will rehabilitate four of the dam's spillway gates, says Chris Varela, Dix's project manager on that job. The work will involve removing the gates, refurbishing large steel wheels that move the gates, and reinstalling the gates. "The gates are large and heavy, and we'll be working in the winter months under adverse conditions," Varela says. Dix will have about 30 days to complete the work on each gate, he says. Each gate weighs 300,000 pounds and is 50 feet tall by 50 feet wide. Coinciding with the spillway gate rehabilitation, Dix also will upgrade fish-passage facilities at the dam in a $300,000 project designed by the Corps to accommodate migration of Pacific lamprey. In that project, Dix will install steel plates in certain places where rough surfaces hinder lamprey passage. The Pacific lamprey is a native eel-like fish that is born in freshwater, migrates to the ocean, and returns to freshwater to spawn and die. It needs to latch onto smooth surfaces with its sucker mouth to conserve energy while migrating. In the Arizona bridge job, Dix will assist in portions of the design for the $5 million restoration of 1,600-foot, riveted-steel Gillespie Dam Bridge, on Old U.S. 80, about 50 miles southwest of Phoenix. Varela says TranSystems Inc., a Kansas City Mo.-based transportation-engineering company, selected Dix to design a thermal-expansion system for the 82-year-old bridge, which crosses the flood-prone Gila River and is listed on the National Register of Historic Places. "We were sought because of our hoisting capabilities," Varela says. "We're designing the methodology for jacking the bridge sections up and putting the plates under them." The bridge will be lifted in nine sections, and steel plates will be put under the ends of each section to accommodate thermal expansion, he says. Four LSR dams together provide about $90 million per year profit (revenue-costs) for the federal government, not including Salmon Recovery costs which is currently approaching $1 billion per year. 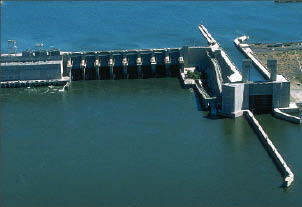 Four LSR dams Power Sales "Preferred Firm" Sales average $150 million per year while "Surplus Sales" averages $120 million per year from Lower Snake dams (1999 - 2004).